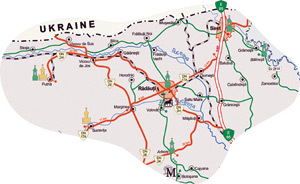 Situated in the plain between the rivers Suceava and Sucevita, 37 km away from Suceava city, at 375 m altitude, Radauti is one of the oldest towns, being known since the 14th century. 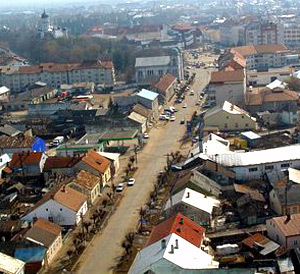 Radauti Town – general view. 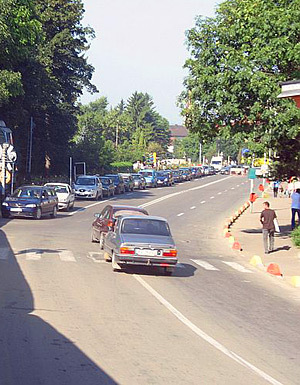 The Museum of popular arts from Bucovina, founded in 1934, it presents in all its 11 halls a rich collection of items that reveal the traditional occupations of the inhabitants from these lands and the ceramics collection from Radauti, Marginea and Kuty. Bogdana monument of medieval architecture, Bogdan I’s foundation, the first voivod of Moldavia. 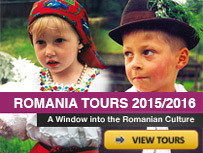 It is the oldest and the most precious royal metropolis in Moldavia. Marginea. Locality situated 10 km away from Radauti, it is a famous centre of popular art where people make various items of black and red ceramics, with polychrome enamel. Solca. It is a small town, lying 20 km away from Radauti, in the depression with the same name. It was mentioned for the first time in documents in 1418. The touristic objectives in this area are a church founded by Stefan Tomsa in the beginning of the 17th century and an ethnographic house realized exclusively through the combining of some wooden round girders. Putna Monastery, it lies in Putna village, on the river with the same name, 32 km away from Radauti. It is Stefan the Great’s first foundation and his resting place and his relatives’ as well.Stefan the Great’s tomb is covered with a marvelous plate carved in white marble. In the precincts of the monastery, there is a museum that holds documents, rare books, various items and golden thread embroideries. Sucevita Monastery. Among all architecture monuments from the North of Bucovina that present external paintings , Sucevita Monastery is the best preserved one. It is situated in the village with the same name, 19 km away from Radauti. The walls of the monastery are made of rough stone and are 3 m thick and 6 m tall, exposing massive octangular towers and abutments.Built by Ieremia brothers and Simion Movila between 1582-1584, the edifice was painted in the inside in 1601 by the Romanian painters Ion and Sofronie. 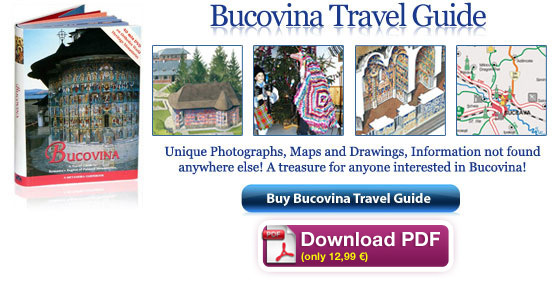 The inner and outer frescos, dominated by bright colours, especially green, are characterized by a huge number of images and by the presence of decorative elements specific to the folklor of Bucovina. The museum from the precincts of the monastery contains a rich collection of old items, manuscripts and embroideries. Arbore Monastery, it lies 10 km away from Radauti and it’s another monument of medieval architecture, built in 1503 by the minister of war Luca Arbore. Here one may find the Toader Hrib collections of history and ethnography. Balinesti Church, it lies 13 km away from Siret town and it’s a medieval church, built by Ioan Tautu between 1493-1499. Yes, Linda, you are right. It is a statue of Bogdan II. sunt din Bucuresti,am avut ocazia sa vizitez Radautiul,m am intors ieri.mi a placut,am fost 1-a data in acest oras si am ramas impresionat.cine vrea mai multe inf. sa ma sune la 0721149884.